Free continental breakfast and Wi-Fi and a seasonal outdoor pool all near Fort Jackson let our guests enjoy Columbia to the hilt at the non-smoking La Quinta Inn Columbia SE/Fort Jackson. The five-floor La Quinta Inn Columbia SE/Fort Jackson has 116 comfy rooms with free Wi-Fi premium cable TV and coffee/tea makers. Guests appreciate the additional convenience of microwaves and mini-fridges. The hotel's free continental breakfast includes make-your-own waffles fresh fruit hot and cold cereals pastries bagels breads yogurt coffee milk and juice. The hotel also has a seasonal outdoor pool a fitness center and free parking. 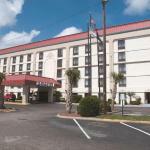 The hotel is on Garners Ferry Road right off I-77 and two miles from the southwest edge of Fort Jackson. The University of South Carolina is five miles northwest of the hotel. EdVenture is seven miles northwest and Riverbanks Zoo is nine miles northwest of the hotel. If you're driving from Columbia Metropolitan Airport the hotel is 13 miles east. Dogs up to 30 pounds are allowed. There are no additional fees or deposits if paying by credit card. If paying with cash, there is a $50 refundable deposit per pet per stay. Dogs must be declared at the time of check in, and they must be leashed and cleaned up after.